With the rise of Chinese contemporary art, zhou chunya become one of the leading figures. Now his work not only price in the market reached new highs, even in private transactions, a picture is hard to find. On March 3, today art museum a full three layer is the works of zhou chunya school TaoGongLiuLu rendering. Painting master standing in the middle of the hall, out with a smile. 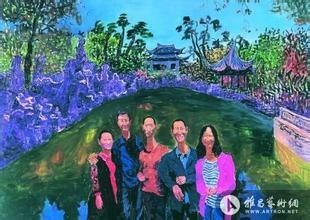 Hug and fang lijun, yue minjun, huang liaoyuan, LiXianTing, uri, guest... Can call artist collectors to present. And the art market volume ranked second, now worth over $200 million worth of many stories behind the artist is not known. Or many children, zhou chunya liked painting when I was a child, often use exercise books in class on the back of the comic strip. But his real art enlightenment is after a change. 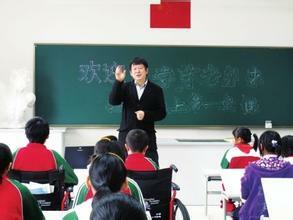 In 1969, zhou chunya's father died, the mother with their three children live very difficult. A kind-hearted neighbor after seeing such a situation, to find a way to introduce zhou chunya in the local art school "having". "Don't eat in the live money, each month to the cost of living in the 12 dollars." Zhou chunya for these still remember very clearly. After graduation, zhou chunya is assigned to the local art club chairman MAO as responsible for paintings. "Do the same work every day, like production." Such life continue to restore the university entrance exam. A lot of people when it comes to the works of zhou chunya mentions that very make public the colour, but people don't know is, he happened to be in the college entrance examination because of bad "color" from the oil painting is squeezed into the prints. "At that time to take an examination of colour is proposition, to color painting a thing. I have been think the color is ontology, and are not interested in proposition, and it didn't play well." Zhou chunya said he was very depressed, now think is fairly good, perhaps because no learn painting so now just to wander. Zhou chunya's early works of basic left nothing, because the art no market, no one pay attention to painting. Zhou chunya often see a good model to ask somebody else say "sit half a day, you gave me finished drawing send to you?" Others also inclined eyes see the along while, finally giving when a model for him. "The worst is I have a picture to give others, the somebody else all seriously, he broke the window, no money to buy the glass, the rainy day rain put my picture in the window. Now know that can be sold, he also regret killing." Zhou chunya laughed. The year 1986, zhou chunya firmly in mind. Because in his view, that is the real turning point in his life. A friend of his who knew a German school foreign affairs office, so I got him a application. Zhou chunya went directly to Germany. "I was the original purpose is to see the picture." Zhou chunya said he go to think that I need only a few dollars each month in China, the west so rich, life certainly don't need the money. So he brought $100 and a box of instant noodles, bought a train ticket for 600 yuan, from Beijing directly to east Berlin, the road used for 10 days. In Germany, zhou chunya found their economic security. Originally thought he was to travel, the man later zhou chunya swore to tell him "I'm here to study abroad to understand western culture! When the guarantor is paused, leave some money on zhou chunya, twist a head and went away. "I don't know is how many money, anyway you know the rent, medical insurance, tuition, meals are to use money." Three months later, the money spent. Zhou chunya started selling paintings in ideal, visited all the local gallery, only one said to him, go back on the phone. "I didn't call me until today." Zhou chunya said pointing at the mobile phone on the desk. Sell failed, and little money, zhou chunya have to start work. At 4:30 in the morning began to move a parcel from the train, and then ride a bike to school at half past six, then the temperature below 30 degrees, to more than a dozen fall in half an hour. "By faith." Zhou chunya said. Later zhou chunya in world famous kassel school of the arts, the teacher let him there from sketch to learn, he is not willing to, himself from the schedule looking like the professor. "At that time a professor's class, called the collective conversation and individual conversations. I find it interesting to listen to. The professor know I'm from sichuan, ask I know not to know 'rent house sculpture. I said that is my teacher. He is happy, then gave me a check for 2000 mark, tell me this call is charged. Later let me when his assistant, 800 mark each month." All of a sudden, zhou chunya's life have safeguard. Only later did he know that the professor is the only one in Europe is "rent" expert. In Germany for three years, zhou chunya impact is quite big, head-turning three years is his art career. "Without the three years, I find it hard to make his art go further." By chance, however, one thing to let him. Once to visit a fair, zhou chunya is small, only some of the artists themselves in the stalls. When a stall in hang a piece of paper, it read: my work is the original painting, and is not made in China. Zhou chunya is asked in the past, the man said to China in addition to know a Lao tze didn't know at all. But have been to Hong Kong, see there are a lot of line drawing, think that China is the place where produce copies. "At that time I feel a little bit Chinese artists face all have no." Zhou chunya, says it is the main power led him to return home. 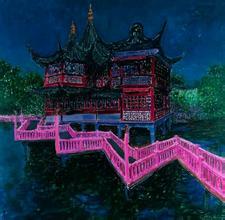 After returning home, zhou chunya started to take Chinese traditional techniques and Germany together the splendid color the avant-garde. Opened his own creation. According to his own conclusion, stone series is the first stage, he useful modern techniques to find factors in Chinese symbols. And the second stage is the green dog series. 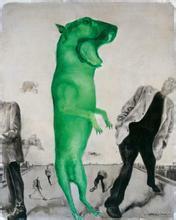 The prototype of the green dog is zhou chunya himself to raise a dog. "After back home, my friend gave me a German shepherd named black root, from holding the day as I slept in a piece, black root of illness after four years, just like I don't have a son." 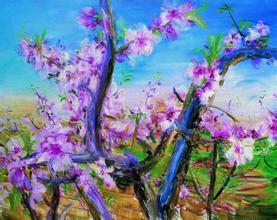 More recently, is the most remarkable series of peach blossom now. Full paper flamboyant peach. Zhou chunya said, "this series is no longer have deliberately pursue symbols mean, but there are too many complicated content." For the auction this topic, many artists choose to avoid. And zhou chunya responded to reporters, "it doesn't matter, you can ask anything." The auction price and volume, he says, he will go to care about. "Because it can be seen how much like your art, sometimes really feel a sense of accomplishment. But when I'm just a news have a look, it will never be." In the 1990 s, the art market basic does not exist, only some Taiwanese come and buy paintings, more opportunities for artists, in Beijing can sell for ten thousand yuan a piece, and his works can only sell 5000 yuan. "I'll draw more, at that time wanted to draw more income is still the same." Zhou chunya said with a smile. In those days when he was the most difficult, some collectors also help him. Once a friend collector with never buy his work to his studio, bought a 200000 yuan paintings, zhou chunya to remember these things now. Good, "he said." a real collector not only to buy sell tomorrow, today that can earn some money, but not many. Real money is often those who like the work itself. At the time of an artist is not admit, someone to buy the painting itself is also a kind of power." Zhou chunya now every one or two months will come to Beijing at a time. Seek the artist friends chat. 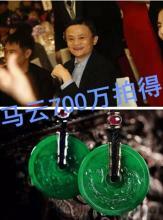 Beijing information, he said, is rich, but does not have to know these together. But the power of each other as an incentive for yourself. "I saw zhang xiaogang, so hard, every day in the painting. I knew I should also be again a little bit hard." He said. He summed up his own character, feel oneself is a seemingly not confident but inwardly we are being absolutely strong person, so he wanted to do something outside of painting. Such as pay for my own an art gallery, to retain these outstanding contemporary works, "let people can see the real original later."